one of the great things about the virtual console service that debuted on wii is the chance to play rare titles that are hard to obtain, perhaps the most satisfying of which are the hitherto previously import only titles. the original sin and punishment for N64 was one such title: despite having english voice acting in its original release it was never released outside japan on the N64. i played that title about two years ago on the wii’s virtual console, and although i enjoyed it at that time i noted that unlike the N64, the wii, with its pointer controls, seemed absolutely made for this type of on rails, light-gun-style gameplay. i have no idea how well the original game sold, but a sequel, titled sin and punishment: star successor, was released for wii in 2009. the virtual console of the first game came just two years before the release of its sequel so it’s unlikely that the response to the virtual console release prompted the sequel: it’s more likely that the original was released to hype the international release of the sequel. regardless of how they made it to our shores, i and many others were happy to get a chance to try both games, not least because they were developed by treasure, a company who i have come to count on to deliver consistently solid action titles, often with shooter elements. sin and punishment 2 improves on the original release in several key ways, the most obvious being the pointer controls. in the original game you used the main control stick to move your character but had to aim your reticule with the second control stick (although on the original N64 controller you had to use the yellow arrow buttons), but in this game you just point to where you want to shoot. this def. doesn’t make the game overly easy, as the game is packed full of boss fights (which i now recognize as being a treasure hallmark), which require varying ratios of dexterity versus powers of observation. 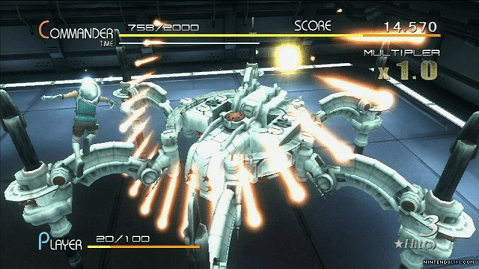 even getting to the boss fights takes some strategizing as well as skill: as in the original your character has the option of shooting or using her/his blade for close attacks (for example, to reflect a missile back to her/his opponent), or dodging by doing a quick roll in any direction (incidentally, the controls were subsequently echoed in the flying sections of kid icarus: uprising). on top of a decent length for the normal-mode campaign (howlongtobeat.com estimates it at 6 hours) the game has easy and hard difficulty levels, online leaderboards (although taken offline earlier this year), and two characters with different shooting abilities (charge shot or lock on to multiple targets). in order to achieve the highest scores you’ll need to keep track of the game’s hidden achievements which take the the form of medals that appear due to certain unspecified conditions (see this link for what seems to be a comprehensive list). although kotaku ranks the game as one of the best of the wii’s library, i just couldn’t bring myself to add the game to my list of greats, despite greatly enjoying the majority of my playthrough (on normal). the game’s story is fairly nonsensical, but not nearly as hard to follow as the original (reading the instruction manual gives you a lot of the context that is otherwise missing from the game). the graphics are pretty good for the wii (esp. given all the action happening onscreen) and i don’t remember there being significant amounts of slowdown. the game has some fantastic over-the-top moments of awesomeness and at its best it throws you scene after scene of unique scenarios that all work within the game’s mechanics, but there are definitely some stages and boss fights that pale in comparison so much that they cause the overall experience to suffer and really lose a lot of momentum. the beginning in particular is quite slow, although that could almost be forgiven as it eases the player into the experience. but the game also revisits set pieces from the original, which i found somewhat disappointing, and if i hadn’t played the original i may have held this one in higher esteem. unlimited continues definitely improve the overall experience, although the two-player mode is pretty lame (basically the second player just gets to act as an off-screen shooter and point to add his/her firepower to the first player’s). the boss battles are generally satisfying, although you should keep in mind that you should always try using your sword attack to clear an area or reflect projectiles back to the enemies. all in all this was definitely one of the top games i’ve played thus far this year as well as one of my highest-ranked wii games, but its occasional dips in awesomeness prevented me from giving it full marks. no telling if we’ll ever see a sequel, but i for one would be psyched to have one. fortunately there are still plenty of other treasure games for me to try out in the meantime. – nintendolife gave the game a 9. gonintendo.com gave it similarly high marks. – info on a few unlockables at gamefaqs. for info on the variants, see this thread.